Where've I been? In Lexington with my family celebrating my parents' 50th anniversary. Here, my sister and I admire some of the handsome Thoroughbreds for which the area is so justly famed! A Tough Sebago Cup and a Serene Sunset. So Long, Summer 2012. So as I mentioned on Monday, I did, in the end, finally get to sail in my first Sebago Cup on Saturday! I wasn't sure I was going to until I got there. I woke up and went on line to find myself looking at a sort of a Goldilocks and the Three Extra-Bad Bears of a forecast situation. No this one's too little, this one's too much, and this one's just right. Oh, no no no no no. This was this one's just right, and then the other two are "a little more than I'm sure I can handle" and "forget it, I'm taking my kayak so I don't die". Yikes. The worst gusts weren't supposed to come in until after we'd most likely be done, but still. Yikes. So then I looked at the older text version of the NY Harbor marine forecast that I link to over in my trip planning tools. That was midway. 10 - 15 gusting to 20 I think it was. Hm. The gusting to 20 part was intimidating. It would be challenging - but...hm. Maybe. Figured I'd leave the call until I got to the club and talked to our sailing co-chairs, Jim and Holly - in a situation like the one I was looking at I actually trust their judgement as to whether I should sail or not better than mine. First thing Holly said to me when I got to the club? "You should sail!" She said that the NOAA forecasts were generally to be trusted, and she also pointed out that the wind was going to be from the south all day, so if I did get to feeling overwhelmed at any point it would be easy to go home. 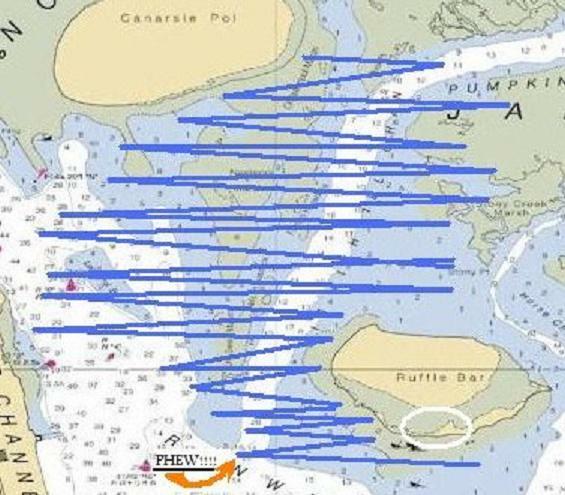 In fact that point was repeated at the skipper's meeting for everyone - there were a number of us who were going to be pushing our envelopes and I think Jim and Holly wanted to have that "if it's too much, just turn back to the club, getting home will be the easy part" idea planted before we set out. Holly also told me that Jim was going to be out in the safety boat instead of sailing - that was all I needed to hear. I picked Baby Blue and started rigging. 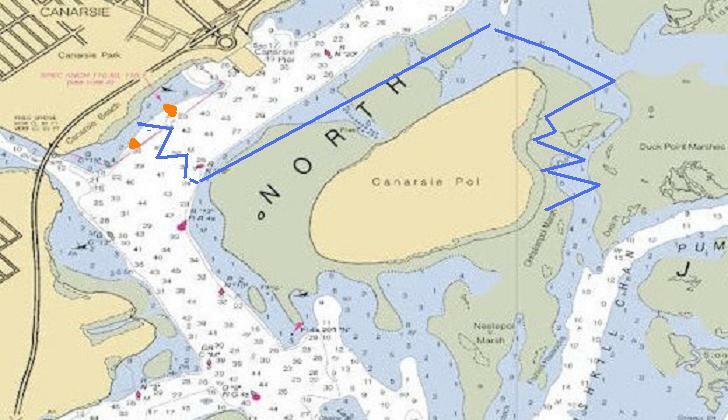 Here was the course of this year's Sebago Cup. Red nun #16 was the only mark that had to be taken a certain way - you left it to port going out and starboard coming hime. Jim had laid it out with the idea of keeping us out of the biggest of the wind and the waves, and it ended up being a very good plan for the day. High water was going to be a little after 2 in the afternoon, so the current was going to be coming in for a while - dark blue arrows. If you did it in a kayak, the course would be around 8 nautical miles. If you did it in a kayak, that is. Muahahahaha. We had the skipper's meeting, got our instructions, and then it was down to the dock. The wind was already picking up pretty good. I thought one last wistful thought about Trusty Romany and then Holly gave me a good shove off the dock and me and Baby Blue were off. It took a while for everyone to launch, which was good 'cause I got out pretty quickly and had some time to warm up. And cool down. It was supposed to get up to eighty, but wow, the spray. I was glad I was wearing my Farmer Jane and it wasn't too long before I pulled out the windbreaker I'd brought along. Wasn't really planning to use it but boy was I glad I had it. I was then glad I had a few more minutes to figure out how many pieces of the boat the windbreaker was likely to snag when I tacked if I let it (pretty much all of them). It was definitely blowy out there - people were getting knocked over here and there; I didn't get knocked over but I did at one point slide backwards off of my boat into the water in a completely ignominious fashion(I think a gust had come up suddenly and I'd leaned to keep from capsizing and then the gust left just as abruptly and there I was completely unbalanced). I chugged a bottle of water 'cause I didn't see how I was going to do it under sail. I considered putting on the gloves I'd brought but decided against it because again, I didn't see how I was going to take them off if I didn't like them. I didn't really try for a good start 'cause I was still finding different things for my windbreaker to snag on when I tacked, and I didn't want to be in close quarters with the tiller extension stuck up a sleeve or something (I did eventually sort that out but I was still working on it at the start). So, a so-so start, in the interest of not breaking anything, and then the first bit of the race was fine. 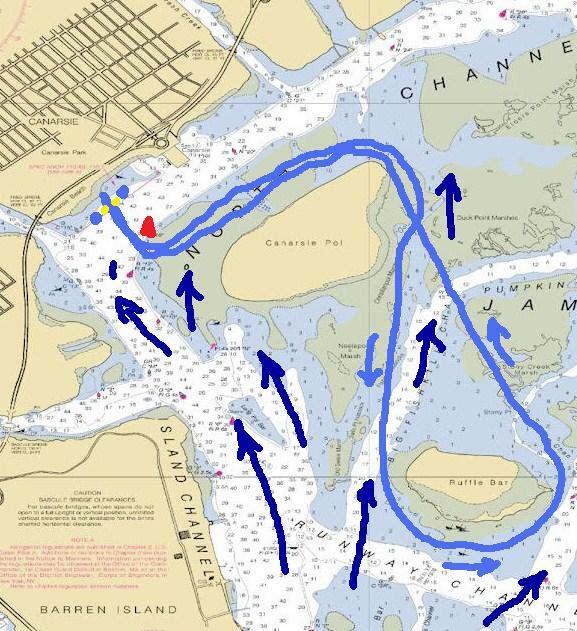 A few tacks to get to the buoy, and then a nice reach along the north shore of Canarsie Pol. Whee. 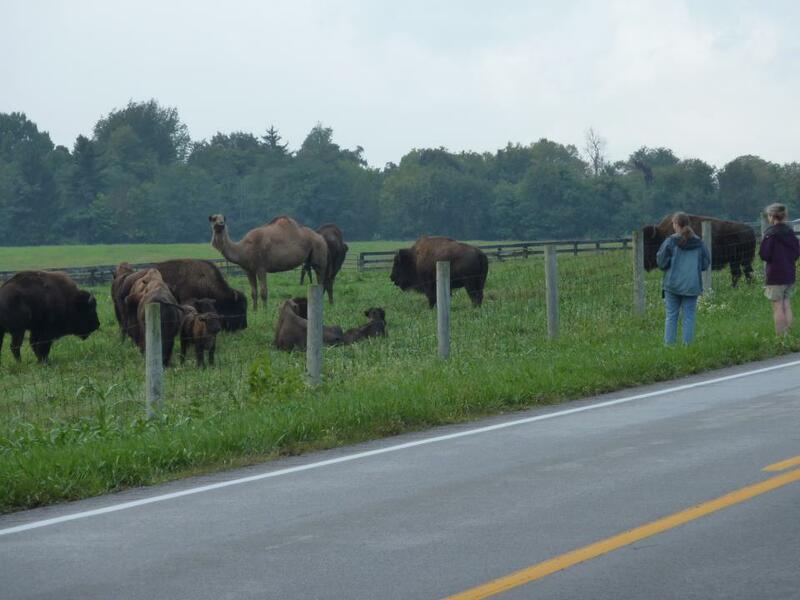 Then we rounded the corner & started south. I decided to hug the shore of Canarsie Pol instead of going outside the little marsh islands just to the east. I saw a lot of other people going outside - I probably should have followed them 'cause my choice involved an awful lot of tacking. Oh well. Cleared Canarsie Pol and OK...off to Ruffle Bar! 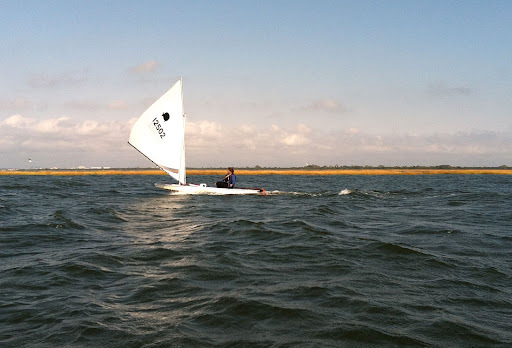 Jim later referred to the upwind leg as "a murderous beat". The word "Sisyphean" also springs to mind. Afterwards, anyways. All that really sprang to mind during the beat were puppylike whimpering noises. Holy cow. I thought the sun was going to go down and come back up and I was still going to be tacking towards Ruffle Bar. The Paerdegat was clearly in view a lot of the time. Soooo tempting. Midway through I saw another dinghy looking weird and as I closed the distance I realized it had a broken mast. I thought about going to see if they were OK but as I got closer I could see that they did appear to be making slow headway back towards the club, and I couldn't think of any way I could possibly help them, and our race committee (Jim and Colin) were coming along in the safety boat pretty soon, and having thusly rationalized keeping going, I kept going...mostly I just didn't want to stop 'cause I was afraid once I did I wouldn't want to go again. So I kept tacking and tacking and tacking and tacking and tacking. My eyes were burning from all the salt splashing on them. I was getting hungry, I had a Luna bar in my lifejacket, appropriate choice 'cause it might as well have been on the moon. I kept tacking. The orange arrow marked "Phew!!!"? 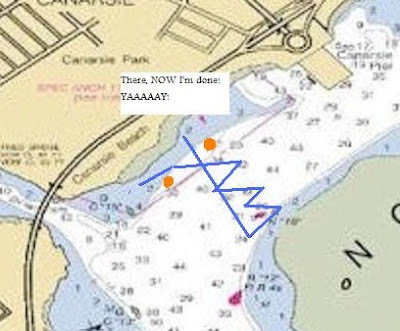 That was the most heavenly moment in the entire race - when I finally made that last tack, came about, and saw that my bow was pointing at open water instead of the beach that I'd found myself looking at for the previous nine-hundred-and-thirty-seven tacks. YAAAAAY! 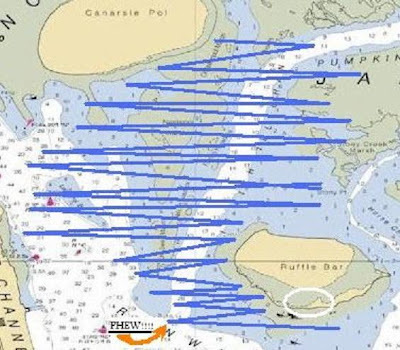 And that's where I said a big mental "Thank you" to Principal Race Officer Jim, because as soon as I made that last tack and saw that I was FINALLY going to clear Ruffle Bar, I pretty much knew that the worst was over (and like I said on Facebook, I feel completely entitled after that beat to break out the oldest chestnut in the sailing joke book and say "Now I understand why it's called 'beating'"). I cracked up when I saw this picture 'cause it's two feet off the water, which is maybe overkill, but the boat did stop trying to go pearl-diving (they're working on the oysters around here but they aren't there yet), and I finally passed Dottie when the same thing happened to her - she was flying along and then all the sudden she just came to a screeching halt, slewed around and ended up pointing off in the completely wrong direction. Still couldn't eat a luna bar, open a bottle of water or even take any pictures, this was not one of those "one hand for you, one for the boat" days for me, this was two hands for the boat at all times - I'm glad Jim ad Colin were taking pictures 'cause the only one I was able to take all day was during a bit of a lull as I was sailing back to the basin after I crossed the finish line the 2nd time...oops, more on that in a minute! 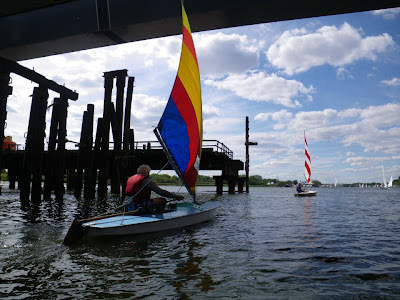 So Dottie and I rounded the east side of Canarsie Pol again, sailing past 2 other Sunfish - one had stopped to render moral support to another who'd capsized; Jim and Colin were there with the safety boat by then so Dottie and I sailed on by, and headed for the finish line. and then I looked back and saw John, the guy who'd stopped to give moral support to another sailor, zipping briskly along the shore of Canarsie Pol towards Red Nun #16, which I'd completely forgotten to round before crossing the finish line. AUUUUUGH! I was so, so tired that my first reaction was "Oh the heck with it" but then I just had to rethink. Not finish the race, when I had been SOOO excited when I finally made Ruffle Bar because I'd actually made it there and was actually maybe going to pull it off, for all my second thoughts about whether I should even sail, because I'd forgotten to round that stupid buoy that was right across the channel over there? Noooo! I was tired but dang, to take a "DNF" when all I had to do was go do the tiny bit of tacking it would take to get around the buoy? No. No no no. Go go go, ya lazy git. And so I finished. No style, no grace, no tactics, just sheer, clumsy getting through it - but I think that has to be the toughest dinghy sail I've done so far, and I was pretty happy with myself for just finishing. The post-race potluck was wonderful, and I finished my club day sitting on the dock with a couple of friends watching the sunset. Mmmm mmmm mmm. The Paerdegat escapes the sunset design flaw complaints I have about much of the east coast - look, somebody had the sense to put some water in front of the sunset at the Sebago dock. A perfect ending for Summer 2012. Oh, and speaking of good events this weekend - New York Kayak Company is first out of the gate for cold water workshops this Fall, Randy & company are holding one this Saturday, September 29th starting at 11:00 AM. There will be gear to test in the Hudson. Water's not bad yet but it's definitely cooling off. If you're a seasonal paddler here in the northeast who's thinking of making the jump to year-round, I can't recommend finding and attending such a workshop enough. For NY Kayak's location & contact info, and to register for the free workshop, visit NewYorkKayak.com. The workshop is in the Event Calendar. This is an unpaid, unsolicited plug. Quickest lunchtime post ever, just passing on a Saturday event in Yonkers that sounds pretty neat. I can't make it but I thought I'd spread the word! Sailing in my first Sebago Cup (and living to tell the tale!) - what a fine way to end the summer! Thanks to sailing co-chairs Jim and Holly for telling me to go for it. And thanks to the race committee Jim & Colin for being out in the safety boat (I think Colin was taking the pictures while Jim drove) - I didn't need you (phew!) but my goodness, it was nice to know you were there. Click on the picture to go to to Jim's album from a breezy day on J-Bay! like doing a little dance where I pretend to ride an invisible horse? OK. No. Almost. But not quite. note slightly later: Oh, shoots. Or would you call this a carp-rese salad? Either way, he was delicious. Garden tomatoes (best summer for those since I started gardening) and basil, with fresh mozzarella from my best find of the summer, Joe's Dairy. Not much longer 'til I'll be putting the bed to bed - couldn't resist having a little extra fun with tonight's dinner. P.S. : Ladies and gentleman, the captain has warned us that it's talk like a pirate day. Kindly return to your sloops and make sure your swashes are securely buckled. Thank you. Oops. I mean, "Arrr". Oops. I was being overly optimistic when I said I was going to write a post about paddling tonight. That happens sometimes in September - I just got going on another one of those time-sensitive things and all the sudden, oops, nine PM. And I knew I had worked myself cross-eyed when I was approaching the Victoria's Secret store and was trying to read the word that's written over the latest buxom-beauty photos in the windows and my first take was "bulbous". Well, they are, sort of, or at least parts of them are. But that's not exactly a word that I would think of as making people rush in off the street to buy foundation garments. Bit of a head-scratcher there. Also a pretty good hint that I'd worked about an hour longer than was going to be conducive to writing a nice post about my first wonderful, lovely, fabulous solo paddle in I can't remember how long. Oh right -- "fabulous". That was actually the word, it was just my tired eyes playing funny word-association games that made me see "bulbous". Catherine C. Miller - we (the audience) were all cracking up at this guy with his old-school cig-in-the-corner-of-the-mouth routine. If he'd made it you would've heard the howl of glee in Staten Island! He didn't, though, and since the Catherine C. Miller was the last in the lineup, a couple of other people tried. This guy made a highly credible attempt, and then unfortunately the boat swiveled around a little too far and the big post on the bow was blocking my view when the kid in the yellow lifejacket gave it a shot. I don't know if it would've been strictly regulation, but I bet that if the kid had made it, the Working Harbor Committee would've awarded him 3rd place. BTW, if you watched the videos, you may have heard the chants of "Cut The Fence! Cut The Fence! ", and a friend also left a comment about it - the organizers did say that this was the worst year ever as far as failed attempts, but it would actually make for a more hotly-contested contest - I bet you'd get a lot more wild throws like this one (Vulcan III, I think they were first and their thrower really went for a long shot - the target bollard is over by the American flag!). Unlikely to happen, of course, but it would be fun. And now, backing up a bit for the bow-to-bow pushing - actually this contest was where being on the spectator boat was great, I got a few good shots with the zoomier of my 2 lenses (not one of those gigantic bird scopes, but I've been very happy with it for shooting ships & boats & stuff), but I think Vlad and Johnna got better shots, and then of course Tugster was actually on a tug - but here are my best efforts! Quantico Creek vs. Maurania III - Tugster actually has a picture of this match (a little more even, right) from on board the Maurania III. And this was what Vlad & Johnna referred to as "Miller melee" - I couldn't make out exactly what was going on out there in that tugboat scrum, but apparently the Miller tugs all started a free-for all! 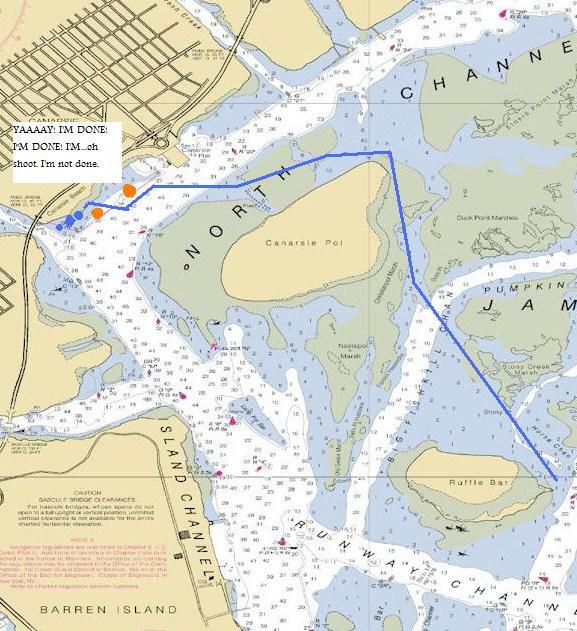 Oh, btw, in my Post Parade post, I'd been wondering if there was a relationship between the Debora Miller (from Miller Marine Services in Port Jefferson, NY) and the rest of the Miller tugs (from Miller's Launch on Staten Island) - well, Capt. Doswell from the Working Harbor Committee (and he and Jean are also old friends from my years at Pier 63 Maritime) answered that, the owners of the two Miller companies are brothers, so I guess the boats are cousins. And guess what? That's it for the on-water section of the 20th Annual Great North River Tugboat Race and Contest! Well, I may actually do a real post tonight (got out for my first solo paddle in ages yesterday, it was lovely, and it was also a bit surprising to me how many of my J-Bay paddler friends busted loose and went solo yesterday - nice day for it, though) but here's a little fun on my lunch break - yep, more tugboats! I switched to videos for part of the line-heaving contest & was very happy to capture the 1st and 2nd place heavers (almost said tossers but I think that's an insult some places). There was no 3rd place because there were actually only 2 who snagged the bollard at all. I'd uploaded the 2 succesful throws to YouTube a couple of days after the race; last night I added Meagan Ann's first try because it was such a perfect demonstration of how the fence behind the bollard was causing issues. The Working Harbor folks said this year was unusual, though - it's definitely a tricky setup but they've been using the same bollard for the last few years & they've never seen so many misses! Here was the 2nd place winner, Buchanan 12. The square bow that renders them less competitive in the race turns into a competitive advantage here, I think, plus they'd already watched a number of other tugs try and fail, and the captain wisely chose a very slow approach. He puts his thrower right where he needs to be & then holds position until the job is done. No record-breaker, sure (in fact it's 1:30 in the video when the thrower really starts organizing himself for the throw) but good enough for second place this year! And then, of course, the Meagan Ann came back for her 2nd run (each tug gets 2). I believe that proper innertubes parlance for this would be "FTW". For The Win. I mean, like, totally. I had almost switched back to photo mode for this run but there was suddenly this sense among the crowd that maybe this was going to be the winning run (I heard more than one person saying things like "He's gonna get it this time", and they'd come so close in their first try) and I decided to stick with video, and I was glad I did, this was just beautifully done. Click on any picture to see these faces properly. Popeye Spinach-Eating Contest at the Labor Day weekend Tugboat Race & Contest. Yep, back to that now! This was the childrens' division. Then things got UGLY. Sept. 11, 2012, a set on Flickr. I've already posted the best but it was a lovely night and of course I took other pictures too. It's not a terrible album, there are only 22 pictures,Mostly of the Tribute in Light and the new WTC 1, but there was also a glorious sunset and the best kind of rush hour - a sailboat traffic jam!